This multimedia activity adds a card with an Internet PIN to each workbook. 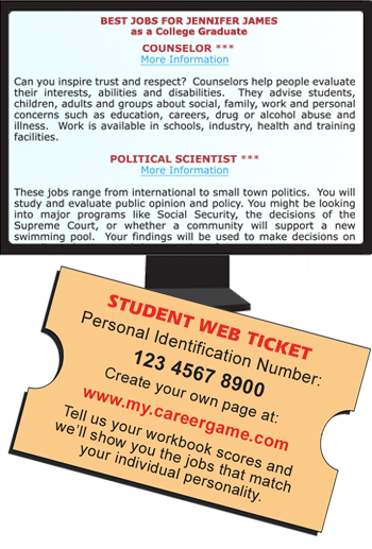 Students log on from school or home to create a personal page** to match their color scores to occupations at four incremental educational levels. Note: Seeing how opportunities and income increase along with educational commitment is both eye-opening and motivating – the best kind of counseling. **Educators get their own page to monitor their student's visits and job recommendations. See the COMPUTER DEMO for details. 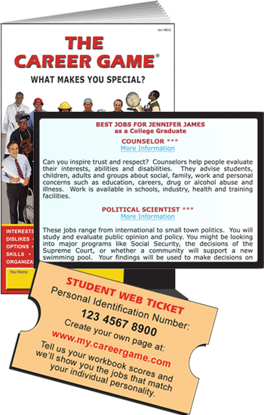 Web Tickets are typically purchased along with workbooks in one of the combinations below. 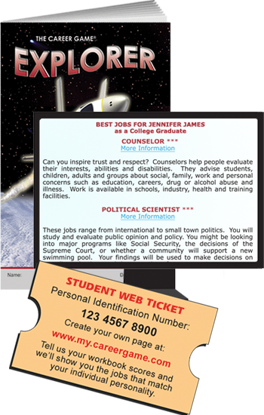 If you already have workbooks, and wish to purchase Web Tickets only, CLICK HERE.